Two-thirds of the Jewish Israeli population are unaware that Jewish couples can only get legally divorced through Israel's rabbinical courts, even if they were married in civil ceremonies abroad; 57% of the public underestimate the number of Israeli citizens from the former Soviet Union who cannot get legally married. This tremendous level of ignorance may explain in part why the battle for marriage/divorce freedom, supported by the majority of Israeli Jews, has not taken up a more assertive mode. Clearly it helps Israeli politicians, from both right and left, forming Israel’s government coalitions, to sell off the public's core civil rights of marriage and divorce freedom to the ultra-Orthodox political parties. This survey was conducted by the Smith Polling Institute for Hiddush – Freedom of Religion for Israel ahead of Lag b'Omer, which is considered “Israel’s Weddings Day”. 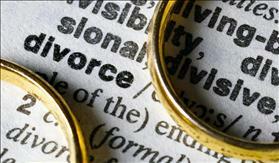 It reveals the Israeli public's alarming ignorance on matters of marriage and divorce freedom. The survey was conducted on May 19, 2016 in an online panel of 500 individuals, a representative sample of the adult Israeli Jewish population. This survey was conducted with generous support from IREP - the Israel Religious Expression Platform. This survey reveals a lack of knowledge, which empowers and emboldens the ultra-Orthodox political parties and rabbinical establishment to maintain their monopolistic stranglehold on marriages and divorces in Israel, with full collaboration from the Israeli political right and left, that continue to prefer selling off these basic civil liberties for political spoils. All the polling consistently show that two-thirds of the Israeli public supports marriage freedom and supports doing away with the state empowered Orthodox monopoly. However, in order for this to become a political reality, the public must truly understand the true extent of this problem. However, there is no doubt that the opposition parties too are responsible for perpetuating the public's ignorance, hoping someday to have the opportunity to trade marriage and divorce freedom to the Haredi parties' in exchange for their political support. The opposition parties almost never raise these issues publicly, despite their voters' will and best interests. 64% of respondents stated that they did not realize that even those Israeli Jewish couples who get married in civil ceremonies outside of Israel (in Cyprus, Prague, or elsewhere) are required by Israeli law to get divorced via Israel's rabbinical courts. 26% responded that they thought that Israeli couples could get divorced civilly in Israel, 24% thought Israeli couples could get divorced civilly abroad, and 14% believed that married couples are allowed to choose how to get divorced from among all of these alternatives. However, Israel does not allow its citizens a choice whatsoever - all Jews must get divorced through Israel's rabbinical courts, and the foreign countries where Israelis can marry – do not offer a similar option to divorce there. 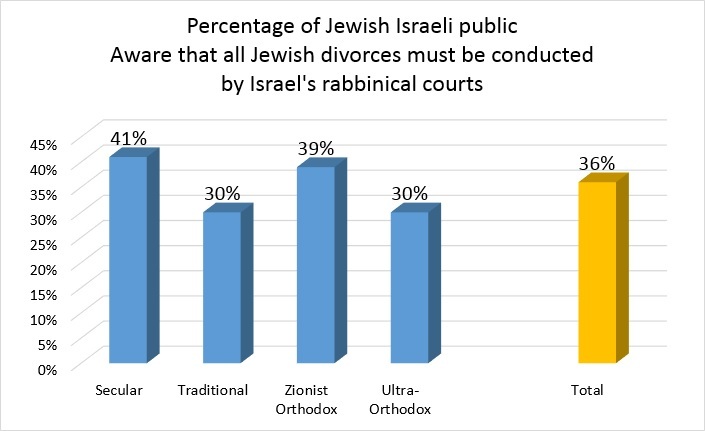 A greater number of women than men were aware that divorce could only be conducted by the rabbinical courts (40% of women, compared to 33% of men). This is likely due to the fact that women are the primary victims of Rabbinical Court divorce proceedings, but even so, 60% of women were unaware. Secular Israelis expressed a relatively high level of awareness of these limitations, for they are the most likely to get married abroad. 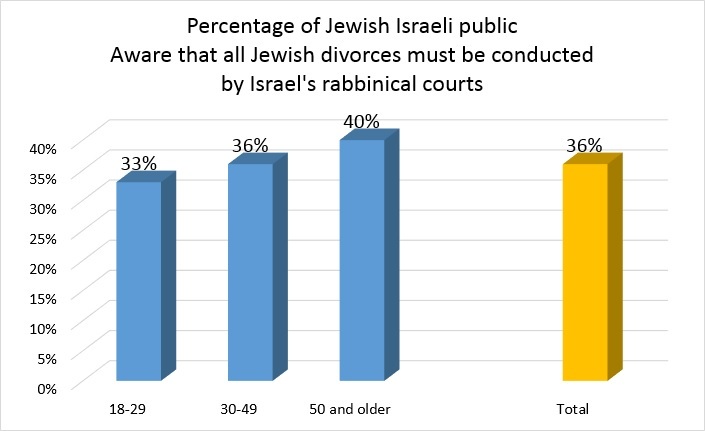 However, only 33% of young adults (up to age 29), the population most likely to get married, are aware that all divorces of Jewish couples in Israel must be conducted via the Rabbinical Courts. On the political level, awareness of marriage and divorce issues is highest among left-wing voters. 70% of Meretz voters were aware that Jews can only get divorced via Israel's rabbinical courts, as were 52% of voters for the center-left Zionist Union party. 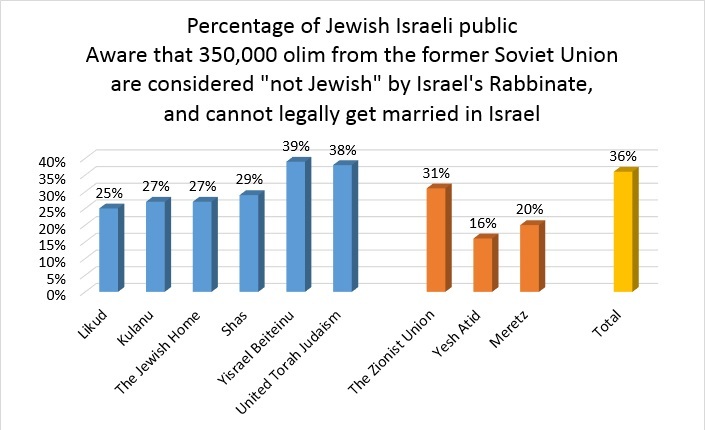 Only 27% of the public is aware that 350,000 Israeli citizens who emigrated from the former Soviet Union are considered "not Jewish" by the Chief Rabbinate, and cannot get married in Israel. 59% of respondents thought the number was much lower: 2% said that there are almost no "non-Jewish" immigrants, 25% thought there were less than 100,000, and 32% responded that there are 200,000. Not surprisingly, 58% of ultra-Orthodox Jews estimated the correct number or assumed the number is bigger. Those who were most aware of the magnitude of the problem faced by immigrants from the former Soviet Union were the immigrants themselves (37%) and Yisrael Beiteinu voters (39%), but 48% assumed the number was significantly smaller. This finding if of particular interest now, as Yisrael Beiteinu is joining the government coalition without demanding that this challenge be resolved. Also of note is the finding that 77% of voters for the civil Yesh Atid party thought that there were far less such immigrants than there are in reality.